Recently the firearm industry has been under fire from state governments, financial institutions, and personal judgment but this has not stopped the steady increase in gun sales. The reality is gun sales have experienced significant increases in recent months compared to 2017. The industry is predicted to grow with a $43 billion dollar projected revenue in 2019 and gun manufacturing is projected to top almost a quarter of a million firearms. This information means there is more demand for firearms and firearm accessories, with demand there must be suppliers. Online gun stores have expanded exponentially and competition is at an all-time high. Gun vendors need to look into other forms of engagement and reach in order to retain their customers and get new quality gun shoppers. Proper internet marketing for online gun shops can increase profits, online visibility, engagement, and conversions for your company. 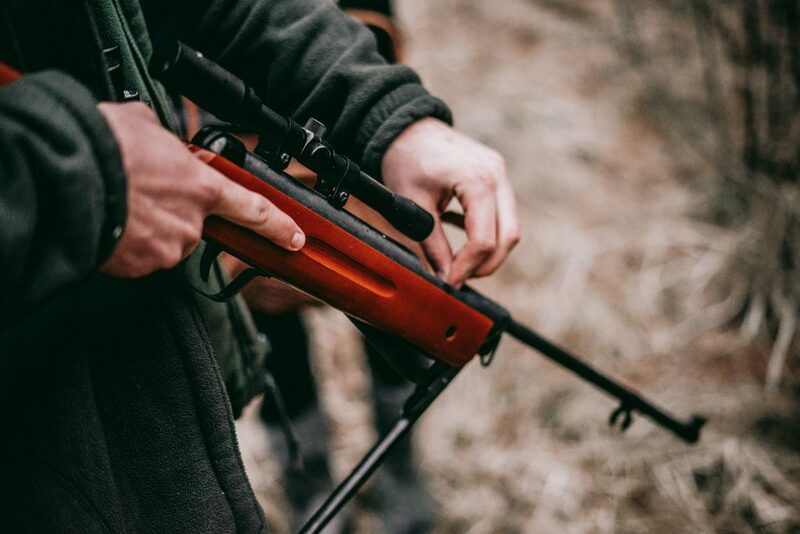 Due to the staggering growth of online gun stores, companies need to look into new forms of marketing in order to differentiate themselves from physical gun stores and other online firearm vendors. …and much more. With our help, your brand will be well known in the e-commerce firearm industry. If you want your gun shop to thrive you will need to put in resources and constant time, but the payoff of your efforts will be worth it all. There are numerous internet marketing strategies you can use to increase your revenue, but there are some key elements you must consider when creating an online gun store. You must follow certain regulations or risk being severely penalized, or in cases, face legal repercussions. The Bureau of Alcohol, Tobacco, Firearms, and Explosives requires all modern firearms to be shipped to a holder of a valid Federal Firearms License (FFL). This means if you are an online gun vendor you must notify your clients of this rule. If the shopper happens to be a new gun owner, they may not know about this and will not know where to ship it to. To keep this from happening, your website can provide customers with a ship to FFL functionality. With this functionality, gun shoppers can enter their zip code and find a certified FFL dealer near them. This saves your customer time thus getting you one step closer to making the firearm sale. … and many more. In addition, chat boxes can help you identify customer pain points and use this data to retarget your internet marketing plan. The data you collect can be used to identify new keywords to target, SEO opportunities, and expand your market share. There are several regulations against running PPC ads, but this does not mean you cannot use search engines to your advantage. Leverage search engine giants Google and Bing to bring in new quality customers to your website and increase your visibility. SEO or search engine optimization is the process of increasing your search engine rankings for search terms related to the firearm industry niche by optimizing your website using various marketing strategies. Your goal is to rank for all the competitive search terms in your niche because this means massive increases in sales and online exposure. Though this is not an easy feat, it can be done with a brilliant team of internet marketing specialists. Studies have shown that 88% of clicks on the search engine results page (SERP) go to the top 3 search results. Unlike other marketing efforts, SEO produces long term ROI when done right. These advertising methods can perform just as well as any PPC ad campaign you wished you had the chance to do. When customers type any relevant search term on Google, you want your gun shop to be the first result to come up. 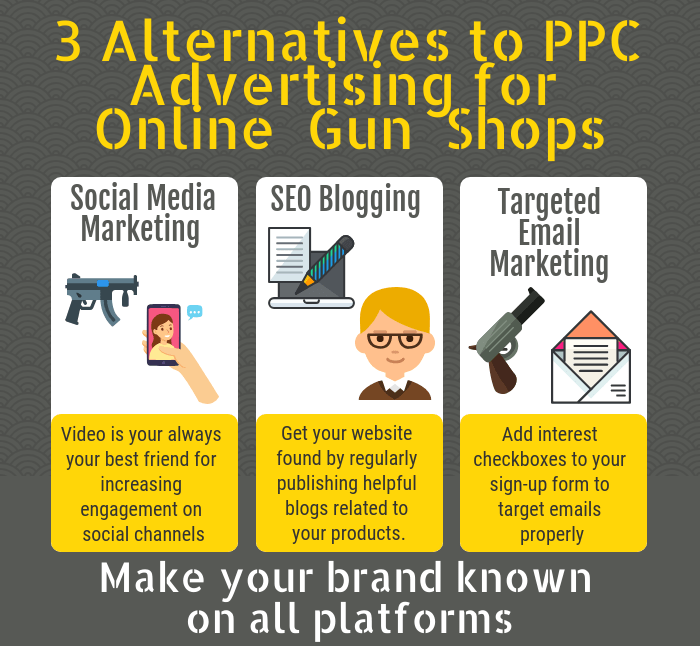 Make your brand known on all platforms by using these PPC advertising alternatives on your online firearm store. With any successful e-commerce business, comes a spectacular firearm website design. It only takes 4 seconds for potential gun buyers to make an opinion about your gun store. 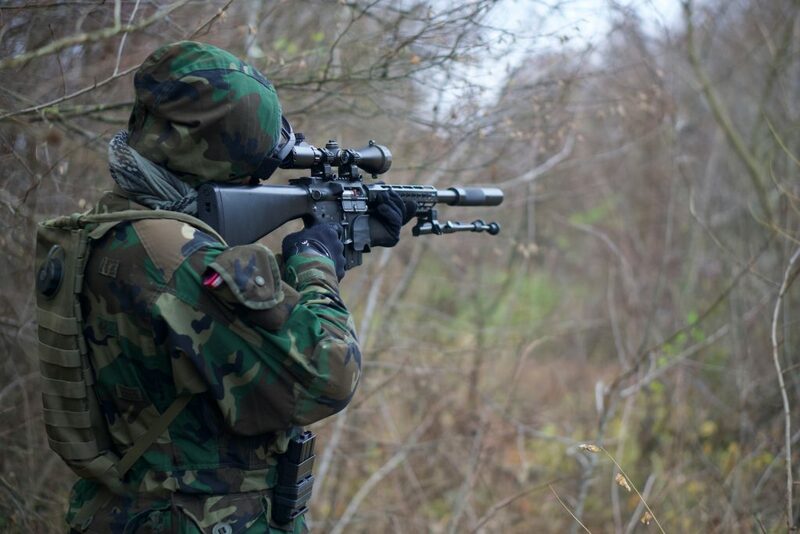 They will either hate it and keep moving forward to a competitor or stay on the page to navigate through the myriad of firearms you have available. You want your online gun store to be one of your target audience shops for guns and accessories at. To do this, your designers and developers must provide customers with a UI/UX responsive site, intuitive navigational tools, valuable content, and an easy checkout process. Through the use of internet marketing you can tap into niche markets you did not know about. Have a trackable marketing strategy that provides better long-term ROI.